« As if Christmas wasn’t Frenzy enough! We have four children and they are all born at Christmas time. Yep! Didn’t plan that too well did we? The first birthday is our elder son, Joe. He turns thirty-two years young tomorrow. We are going to meet up with him in Brisbane and spend some time with him. I think he is planning on taking us shopping for an Esky! 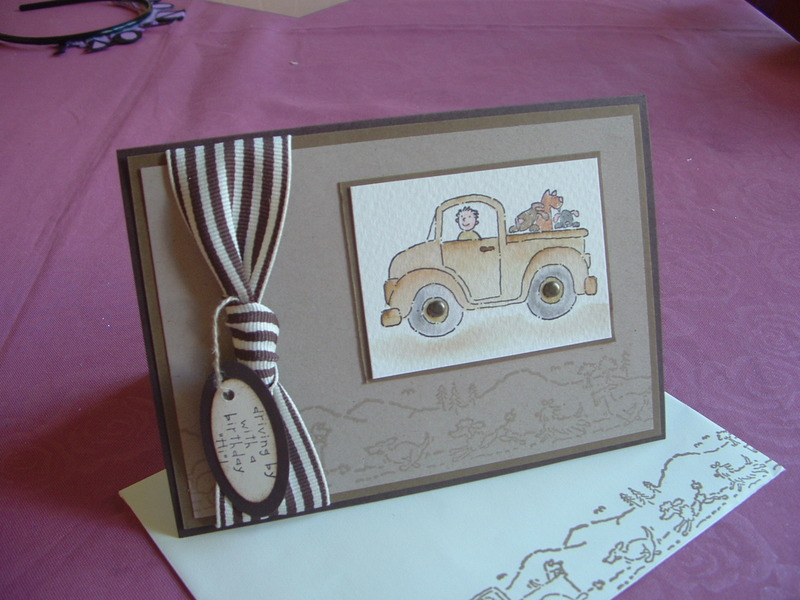 That’s with us paying and him choosing…………..
I’ve chosen good old ‘Loads of Love’ stamp set to make Joey’s card. He drives a ute. He loves his ute. 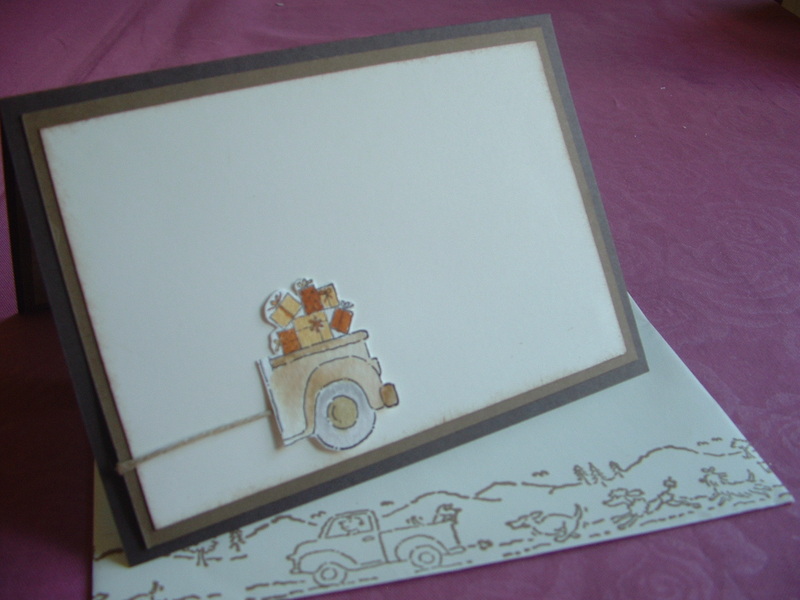 It’s a much ‘flashier’ model than the one depicted in this stamp set, however this card pretty much is our Joe to a ‘T’. He loves strong manly colours and he would desperately love a dog of his own. Growing up in the country we always had at least one dog, so the kids really are doggie lovers. However! he now has three other people in his life that he now must consider. His amazing partner, Anna, and two precious daughters Zaliah and Ava (all three need to be convinced of the virtues of owning a dog!) I thought this card would wish Joe both a happy birthday and happy convincing the girls in his life that he can have a dog. Maybe for Christmas Anna????? This stamp set never lets me down. I received it in my demonstrator starter kit and has been well and truly used since. The name perfectly sums up what we wish for you Joey, tomorrow and every day of the following year – Loads of Love buddy. 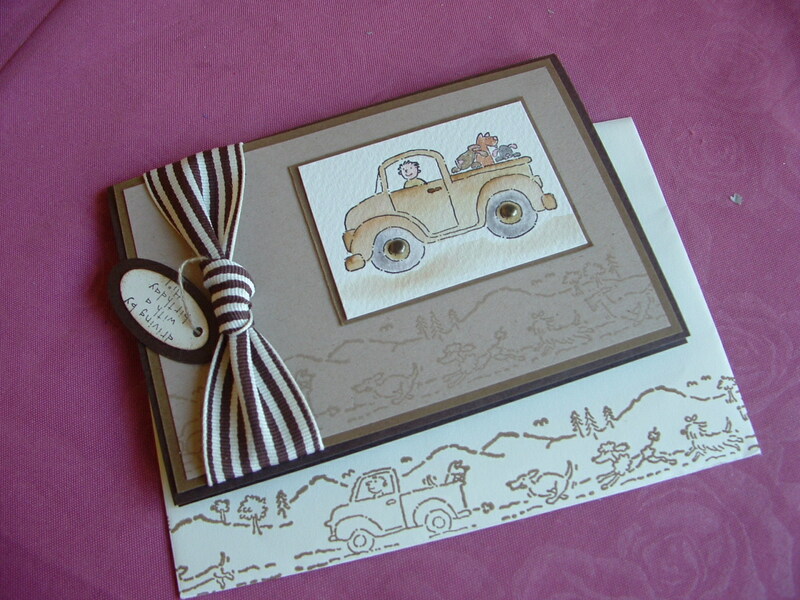 All products are Stampin’ Up! of course! Stamp Sets – Loads of Love and Loads of Love Accessories. There was a bit in this one. I kinda started with a design in mind and like Topsy, it just kept growing. I know Joe will love it and I cannot wait to see him to give him a birthday hug. Very cool, so love what you’ve done with the insert! Clever lady. Will have to case that idea! Speak soon.